Historic regression of Dutch in the Western periphery. The blue line indicates the situation in the 7th–8th century; the red line marks the situation during the 20th century; the black line is the current French-Belgian border. French Flemish (French Flemish: Fransch vlaemsch, Standard Dutch: Frans-Vlaams, French: flamand français) is a West Flemish dialect spoken in the north of contemporary France. Place names attest to Flemish having been spoken since the 8th century in the area that was ceded to France in the 17th century and which became known as French Flanders. 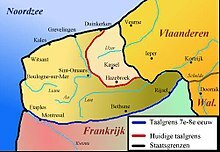 Its dialect subgroup, called French Flemish, meanwhile, became a minority dialect that survives mainly in Dunkirk (Duinkerke in Dutch/Duunkerke in West Flemish = dune church), Bourbourg (Broekburg in Dutch), Calais (Kales), Saint-Omer (Sint-Omaars) with an ethnic enclave Haut-Pont (Haute-Ponte) known for its predominantly Flemish community and Bailleul (Belle). French-Flemish has about 20,000 daily users, and twice that number of occasional speakers. The language's status appears to be moribund, but there has been an active movement to retain French Flemish in the region. A growing, re-introduced language, French Flemish is taught in several schools in the French Westhoek. The ANVT-ILRF was given permission to carry out experimental lessons in four public schools (in Esquelbecq, Noordpeene, Volckerinckhove, Wormhout) for the school years of 2007–08 until 2010–11, after which it would be evaluated. Afterwards, all requirements were met but it was only allowed to continue them, but not to expand to other schools or to the collège. On the other hand, the private Catholic education began teaching Dutch in collèges in Gravelines and Hondschoote. Linguistically, a dialect depends on a larger, national language. That does not apply to French Flemish. We are not connected to standard Dutch because it is an artificial language that was created based on the dialects of North Holland. Research shows that the distance between French Flemish and Dutch is greater than that between Dutch and German. ^ Bientôt une charte pour sauver le ch’ti et les 74 autres langues régionales ?, in La Voix du Nord. ^ Hammarström, Harald; Forkel, Robert; Haspelmath, Martin, eds. (2017). "Frans-Westhoek Vlaams". Glottolog 3.0. Jena, Germany: Max Planck Institute for the Science of Human History. ^ "The Penny Magazine of the Society for the Diffusion of Useful Knowledge". Society for the Diffusion of Useful Knowledge. ^ "Flemish in France". UOC, Universitat Oberta de Catalunya (Open University of Catalonia), subsite Euromosaic – Research Centre of Multilingualism. Retrieved 14 January 2007. ^ "Le flamand fait son entrée dans deux collèges du Dunkerquois" (in French). 1 September 2011. Flemish in France site UOC, Universitat Oberta de Catalunya (Open University of Catalonia), subsite Euromosaic – Research Centre of Multilingualism. This page was last edited on 2 April 2019, at 22:21 (UTC).